Have You Seen Pepper - He Is Wandering Again!? Pepper has not been seen since Sunday (15th April). 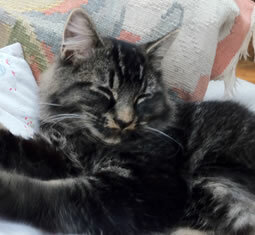 He's a fluffy 2 year old neutered tom, big, bushy tail,& very friendly, he has no collar on but he is microchipped. As regular readers know he is a wanderer and it's not unusual to have to get a call to go pick him up from somewhere - he was found in Barnes in last November! We live in Festing Road, and Peppers area extends to Ashlone, Rotherwood and Erpingham Road, though he has been as far as the Dukes Head, Barnes Rowing club and, on one occasion, Wimbledon (long story). If you think you have seen him please call Chris on 07979652837. Thank-you.